I know, I know. Over the top. I don't care. I've decided I like it anyway. 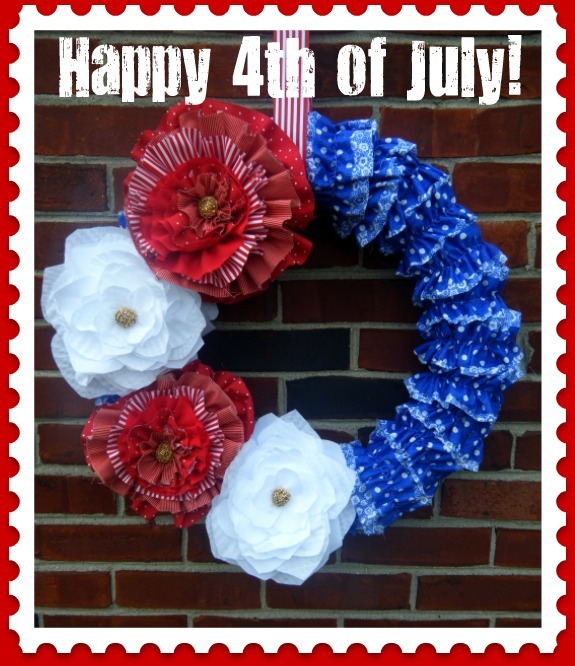 And yes I did finish it last night -4 days before the 4th of July-so my neighbors and I will be celebrating a little longer than usual. It's fine. And since I'm sure you all plan out your projects better than me and have had your decor up for weeks, you can just bookmark this beauty for later. 3/4 yds. or so for each white fabric-I used white rough silk and a textured thin cotton. Step 1: Make the blue ruffle to wrap the wreath form with. Ruffle 'til your heart's content. 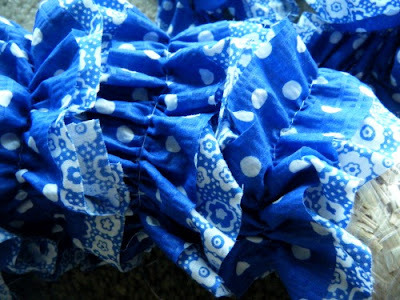 And then ruffle some more. We're going to make a double fabric ruffle! Cut strips of fabric into 4 inch wide strips of the fabric you want peeking out the sides and 3 1/2 inch wide strips of the fabric you want on top. The length doesn't matter because you're going to sew it all together in the end to make one really long ruffle. I think I cut 10-12 strips for each pattern. 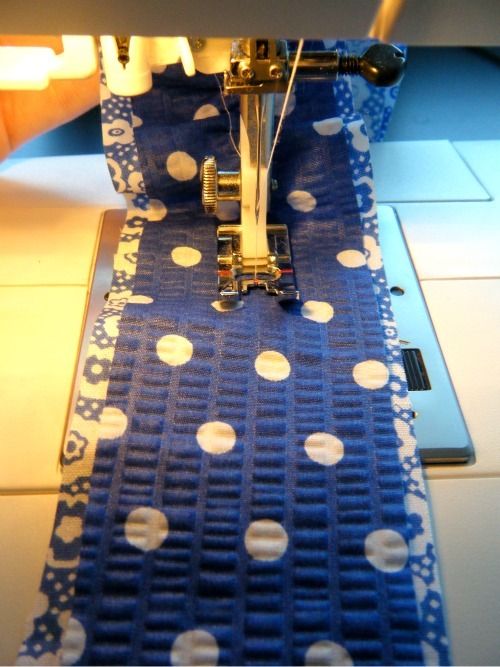 Place the fabric strips on top of each other so the wider strip is peeking from behind the narrower one. Set your machine on the highest tension and the longest stitch length to create a ruffle. 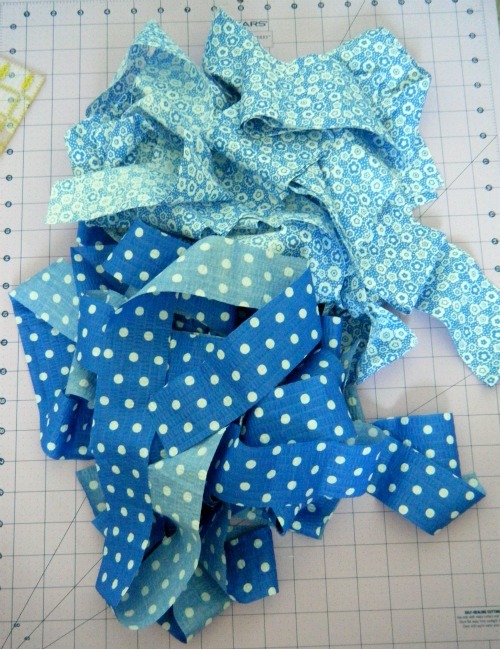 Sew straight down the middle of the strips and they should ruffle on their own. Don't backstitch! Don't you love how the two strips ruffle together at the same time?! 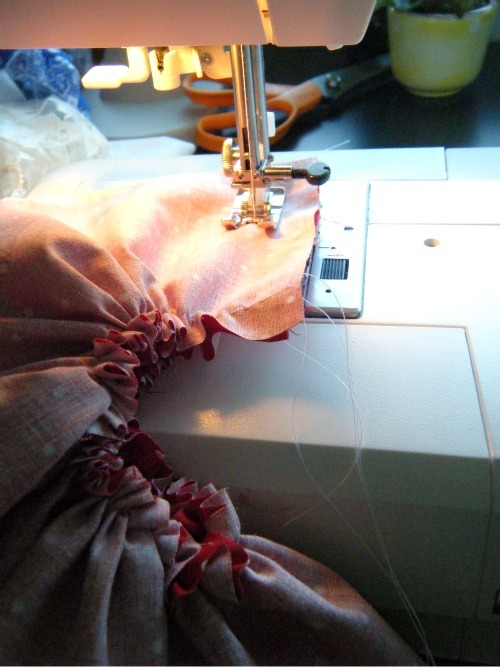 If it isn't ruffled enough, pull on the thread with one hand and carefully push your fabric down the thread to make the gathers closer together. 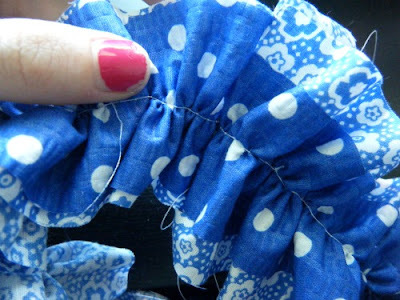 When you're done with all your strips, sew them together by sewing the right sides together on each end, being sure to match up the top strip layers together so it looks like one continuing ruffle when you're done. 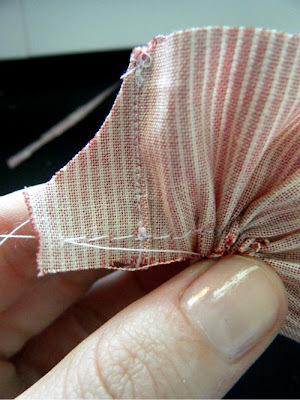 When you trim the threads, trim the threads on the sides of the strips all the way to the edge of the fabric (see the arrow? ), but not too close on the ends. I leave those threads a couple inches longer than the end of the strip so that it doesn't wiggle out and cause my ruffle to un-ruffle. 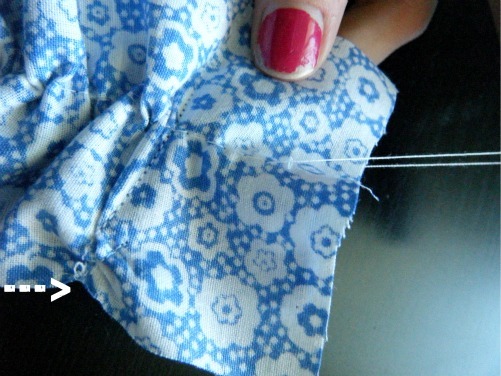 You can also use those threads to tighten up any ruffles that come loose. You'll hide the threads later. Can you find the seam? Don't find my chipped nails, please. 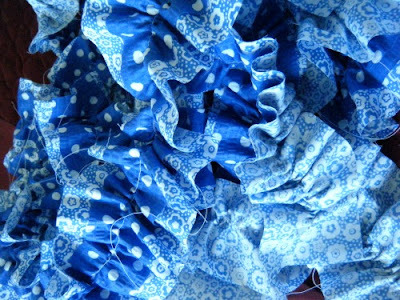 Pile of ruffles all sewn together is complete! 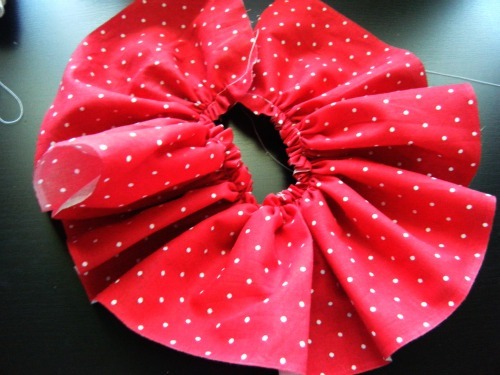 Wrap the ruffled strip around your wreath form, securing it with hot glue. To make the red flower, I basically did a much larger version of the flower on this tutorial at Made by Lex. Fun fact: this was the very first kind of fabric flower I'd ever made before I had a machine so I hand sewed it all. 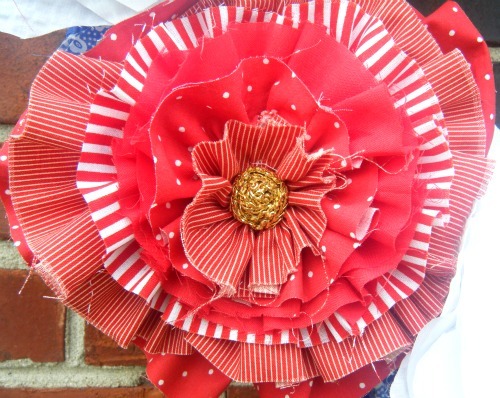 For this flower, I started out with a 4"x45" strip ruffled as tight as it would go. Once all ruffled, sew right sides together to create a circle. In order to be sure the ends of the fabric don't peek out, you can trim the edges after the seam. 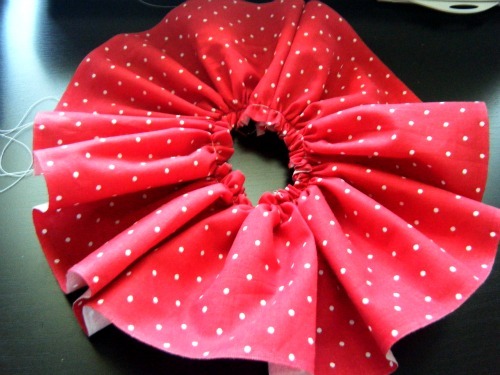 Then you have your first ruffled circle. 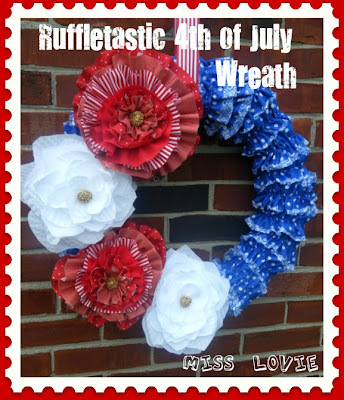 Do the same with trimming your threads on this ruffle as you did for the long ruffle you used to wrap your wreath. 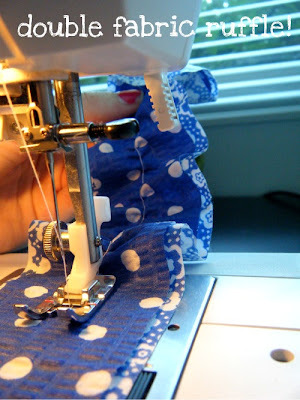 For the rest of the circles, just continually decrease the width of your strips by 1/4 or 1/2 inch as you go and your length several inches as you go. I alternate the patterned fabric for each strip. Make 6 (or more, if you want) circles total. The smallest of my circles was about 1 1/4 in. wide and about 10 inches long. Stack the ruffled circles and hand sew them together. 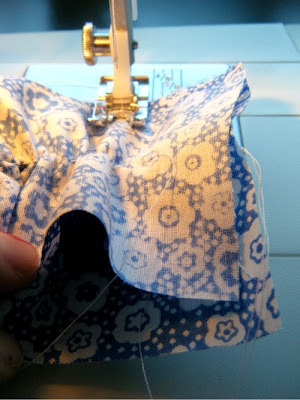 In order to get them to turn up a little instead of laying flat, you can hand sew it like this some on the back. 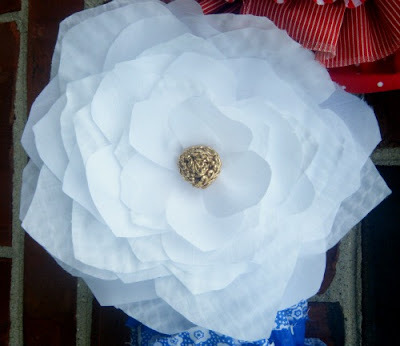 To make the white flower, I used the poppy tutorial on Grosgrain. 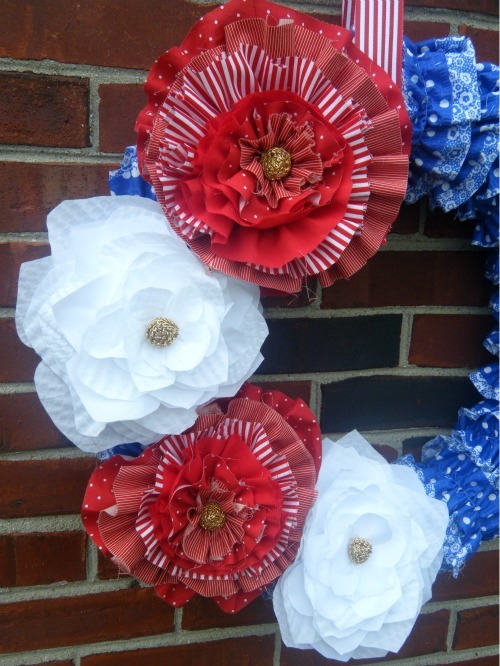 This is the same tutorial I used to make my Memorial Day Poppy Pin. For these flowers I alternated the silk and textured cotton. it definitely gave it a nice textured look! Make two of each flower. Step 3: Attach flowers and ribbon. Attach your flowers with straight pins. Peel back a couple ruffles and stick your pin in. 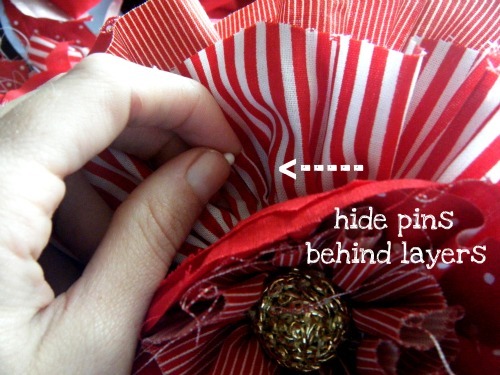 Use a few pins per flower. 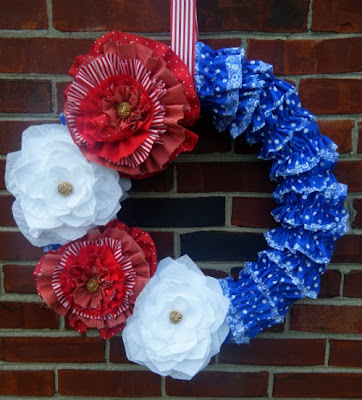 Use your ribbon to hang your wreath. If you use a door hanger, camouflage that ugly hanger with my tip here in step 6. Those flowers are so outta control. American Love. 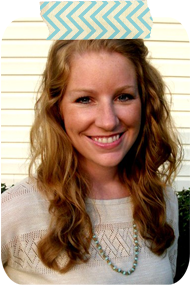 We're spending it in Paducah on Kentucky Lake with my friends I discussed in this post. After teaching two weeks of summer school, a 3 day weekend on the water and in the sunshine with my favorite people and puppy dogs is very welcomed! That is super cute! 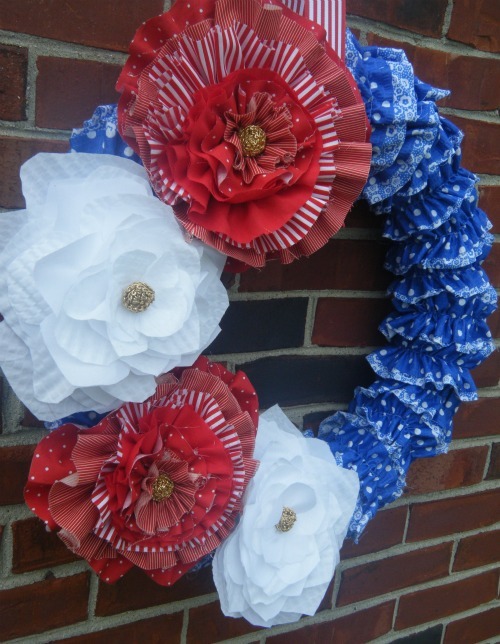 Honestly my favorite 4th of July wreath out there. And I had to laugh at your line about everybody else having had their decor up for weeks already . . . my 4th of July decor consists of precisely nothing. So you're still way ahead of me! You're really getting into America this year and I. Love. It. I love this idea and so much easier than the ribbon wreath. Just finishing one for the 4th and will use this for next time around. Thanks for sharing.